Andrew Stanton, a filmmaker who co-wrote the “Toy Story” movies, says, “A great story comes from using what you know, capturing a truth from experiencing it and from expressing your values you feel deeply”. He suggests you allow the listener to make their own deduction about you from the story. That is, come out and say you’re collaborative, adaptable, or anything – you tell a story that convinces your listener you possess these traits. Stanton says a well-told tale grips, excites and engrosses. Even with the low unemployment rate, the job market is still a difficult one for job seekers. 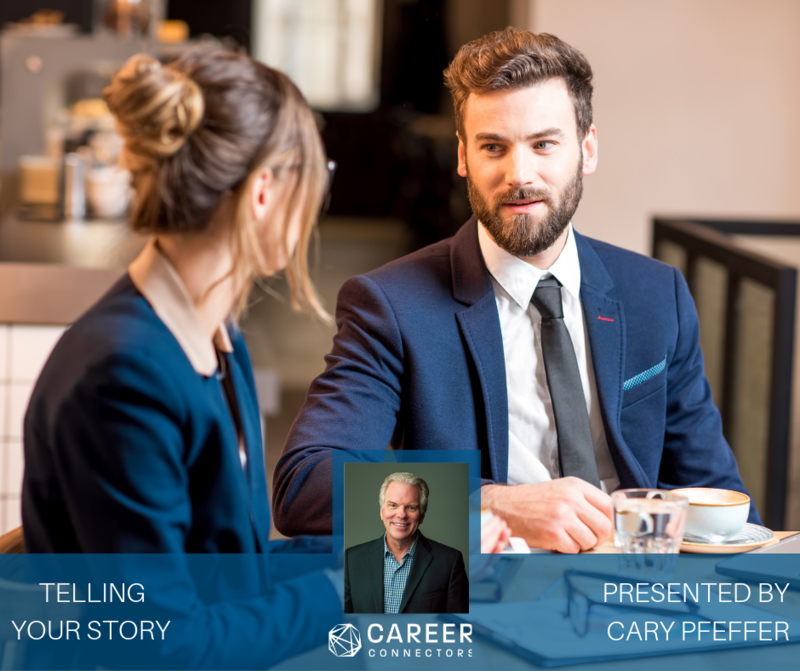 Cary shared with us how to make yourself stand out from fellow job seekers and how to leave a lasting impression with the interviewer. Cary reminded us it takes just a few moments to reveal a great deal about ourselves and an organization. Points to be effective include….. When you are asked to “tell us about yourself”, you need to…. Research has found that “most written communication is interpreted more negatively” than it is intended. Just like verbally sharing your story, you also need to know the audience and know your comfort zone; and be a good editor to share your story in writing. Consider the words you are using and whether they work for your story and if they connect with the employer. Focus on what you are going to say as you begin your story; the goal is to capture the audience’s attention. Less is more; get to your story early. Consider how the audience hears you; remember your word choice, voice tone and body language. Think about how you will handle Q&A; allow the audience to think about the presentation before seeking questions. Give thought to how you want to end the Q&A. The most overlooked skill in communication is listening. Smile! Vixxo is a technology driven asset and facilities management company that services clients such as Starbucks, Target and Michaels. There are 700 associates across the US and Canada. Vixxo has been an INC 500 Fastest Growing Private Company for 8 years straight. The company’s culture is a team of doers that create innovative solutions for their customers in a fast-paced environment. They believe that their employee diversity is their strength. Some open positions include: Data Architect; Decision Support Analyst; Director, Data Governance; Director, Reporting Strategy; HR Coordinator; Senior Accountant; Service Coordinator; Sr. Director, Supply Management; Talent Acquisition Coordinator; VP Project Management Officer. For more information, go to www.vixxo.com/careers. Headfarmer’s mission is “to serve our community and its families by helping professionals connect and grow”. There are several things that set Headfarmer apart from its competition, including their proactive approach to cultivate an exclusive network, build meaningful relationships, an extensive due diligence process and purpose driven approaches that will enhance lives and enrich organizations. The organization handles both direct hire and temporary solutions in the Accounting & Finance and Technology arenas. A sampling of Accounting & Finance opportunities include clerical & entry level accounting, staff/senior accountant/tax, Accounting Manager/Assistant Controller, Controller/ Director/C-level, audit, and corporate financial planning & analysis. Technology possibilities are Help Desk Support Technician, Architects & Developers, Business Intelligence, DevOps Engineers, IT Manager/Director/C-level, and Cyber Security. Go to their website for a complete listing. Farmers, one of the largest and most respected insurance brands in the USA. It was founded in 1928 in Los Angeles. Farmers is a leading insurer of small and medium-sized businesses and operates a large Life-insurance company as well as a rapidly growing financial services company (Farmers Financial Solutions). Certified as a Great Place to work in 2017, the company fosters a casual work environment and community outreach programs. Open positions include Inbound Sales and Customer Service. For current job opportunities and to apply, visit their website. In today’s job market, 58% of all new jobs are in STEM. Computing jobs are the #1 source of new wages in the United States. To help you get the necessary skills to compete in this job market, GCU is now pleased to be offering Immersive Java Boot Camp. The camp includes more than 600 hours of project-based collaborative instruction, accelerated path to employment, competitive pricing for an on-site experience, and transferable college credits. De Anne Russell, Career Connectors Board Member, closed the meeting by thanking Highlands Church & the volunteers. 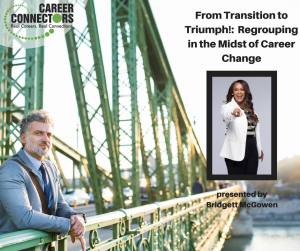 The next Career Connectors meeting will be in Glendale on Thursday, October 18, 2018 & features Travis Hardin, as speaker for the topic “Your Focus Determines Your Expansion.” For additional information on this event & future events, please visit the Event Schedule. Jessica Pierce welcomed the group and explained the agenda, which was a bit different from a traditional meeting. 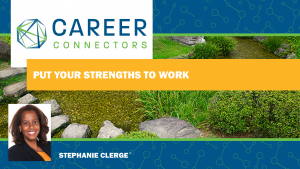 Instead of one keynote speaker Career Connectors was fortunate to welcomed six staffing agency experts. There were two panel discussions: the first panel discussed myths associated with staffing firms, and the second panel discussion reviewed the advantages of working with staffing firms. Question: What are the different types of staffing firms? Answer: There are a number of staffing firms to choose from based on the type of industry and work the candidates are seeking. Agencies have all types of employment options available for job seekers: direct hire, contract to hire, temp to hire. Question: What is the conversion rate? How many clients do you help land jobs? Answer: We don’t have stats on our conversion rates, however many times employees are hired for full time work. By partnering with a recruiter, you land the job. Question: Why do you think people don’t trust staffing firms? Answer: It’s like many other industries, such as used car dealerships. Generally speaking a used car salesperson doesn’t have the best reputation. These generalizations are based on bad experiences. Sometimes when you work with one staffing firm, you are never called back and the assumption is that all agencies work that way. Next time you speak with a staffing firm, interview the agency. Ask questions such as: How long have you been in the industry? What does the process look like? When will I be called back? Question: If I use a staffing agency, will I make less money? Answer: The pay rates are competitive with the market. Question: Does the staffing agency only work for the company seeking employees? Answer: If we don’t have the candidates, we don’t make any money. We need to work for both the employer and candidate. Question: If a candidate wants to work for a specific company like Google, how do they find out the staffing firm that works with them? Answer: Call and ask the staffing firms. Question: Why work with a staffing firm? Answer: A staffing firm provides you with insider information on everything they can including income information, process time involved and anything else they may know about the company. Additionally, recruiters are well connected and will be your biggest advocate. Question: How to best prepare to work with staffing firms? Answer: Know what you want. Spend time thinking and researching what direction you want to pursue, but also have an open mind. Answer: The company seeking employees pays the staffing agency. It is a free service for job seekers. Question: What do you like about staffing? Answer: It is a fast-paced environment, where we as recruiters get to help people on a daily basis to improve their lives. Question: How are people most successful working with you? Answer: Candidates that stay in touch regularly do very well. Question: How do you help the job seeker prepare for a job placement? Answer: We help by coaching on interviewing skills. Grand Canyon University offers an in-depth boot camp for Java Programming. There are many perks that this curriculum offers to individuals such as; additional skills in the dynamic IT field, and a more competitive advantage in the job market. Entry level positions average $65,000 a year. Jessica Pierce concluded the meeting by thanking our wonderful host Grand Canyon University for their support, our event sponsor LT Ladino-Bryson from vCandidates, as well as all our amazing panel, corporate sponsors and volunteers. Jessica went on to remind our guests to visit the Career Connectors website for additional information and support such as the complimentary DISC assessment and other helpful tools. The next meeting will be held on October 11th, 9 am at the Scottsdale location of Highlands Church – 9050 E Pinnacle Peak Road, Scottsdale, AZ. Please remember to sign up online for our next meeting. Ted Robison, also known as “Mr. 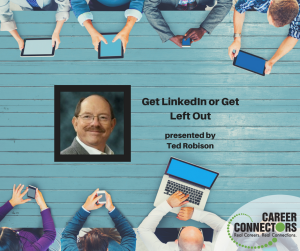 Link-Me-In,” has been coaching LinkedIn techniques for the past nine years at Career Connectors, church ministries, universities, colleges, companies and recruiting firms. 87% of job seekers will find a job through networking, and Ted provided many helpful techniques and tactics for making the most of your LinkedIn connections. You should be on LinkedIn for creating connectivity, raising your brand and visibility, and to be found. While aiming for more than 500 connections on LinkedIn, you should also be engaging with professionals and online groups within LinkedIn. Ted says “connections are good, but relationships are golden.” There are more than 500 million subscribers on LinkedIn, where engaging with others is based on three degrees of separation. Ask for introductions when one of your first level connections is connected to a 2nd level that you would like to get to know. Offer to take that person to coffee or lunch to ask them about their company and its culture. Your profile page on LinkedIn is your personal brand and image promotion. Customize it! There is a hidden job market that accounts for 80% of the jobs. Create a list of 30-50 target companies. Use the Phoenix Business Journal Book of Lists and Reference USA to learn more about your target companies. You can then build relationships of the employees who work at these companies by reaching out to those 2nd and even 3rd level connections through your own LinkedIn network. Companies offer referral bonuses, so build your connections of employees at your target companies, and, when a job is available, your connection can refer you. It’s a win-win situation. If you’re hired, you have a new job and your connection receives a referral bonus. Once you have an interview, you can continue to use LinkedIn to prepare. Research the company to know their products, services, competitors. Know the company’s culture and core values to determine if you would work well in that environment. Also, research your interviewers. Knowing their hobbies, work history, and common groups will help you connect in the interview. LinkedIn also has a new learning section to brush up on skills that may be needed in the role for which you are interviewing. Know your value propositions – what differentiates you? You don’t want to be left out in today’s job market, so be sure you are linked in on LinkedIn. Technology advancements have hurt the hiring process and alienated qualified people. If you have worked with staffing firms but haven’t been thrilled with the results, vCandidates is launching a subscription-based platform in October connecting recruiters with candidates. The company will foster open communication, candidate engagement and organization, with platform key features beyond the popular job boards. The candidate can present themselves in their own voice. This new recruiting tool will combine technology with the human touch. In the job market today, 58% of all new jobs are in STEM, and computing jobs are the #1 source of new wages in the United States. To help you get the necessary skills to compete in this job market, GCU offers an Immersive Java Bootcamp. In 16 weeks, the bootcamp is more than 600 hours of project-based collaborative instruction and your accelerated path to employment. The courses completed within the bootcamp are part of GCU’s existing, regionally accredited programs. These courses are transferrable to a GCU bachelor’s program, or eligible for transfer at the discretion of other regionally accredited U.S. institutions. There are also Enterprise IT career opportunities in numerous IT disciplines. Go to www.wellsfargojobs.com for a complete list of available positions here in Arizona, and in other locations. If you don’t see what types of openings appeal to you, you can set up a job search agent online, which will notify you when an opening is available that matches your criteria. More information about these position plus other orporate career opportunities can be found at www.northwesternmutual.com/corporate-careers/. Or reach out to the Director of Recruitment and Selection, Megan Wotton, on LinkedIn. You also have the option of becoming an agency owner. Allstate has a 90% retention rate because as you grow your business, you build your success and own your equity. There are no royalty fees or franchise fees. A minimum of $100,000 spendable start up capital is required, but the advantages of being an Allstate agency owner are no inventory, repeat revenue, and competitive compensation in a high demand field. You can earn what you are worth, with a recognizable national brand backing you up. You can even begin without insurance experience or your license. Allstate will help prepare you for your new career. Contact Nate Smith or visit www.allstate.com/careers for additional information. Thank you to our premier and corporate partners for their continuing support. A special thank you as well to our host facility, Central Christian Church. 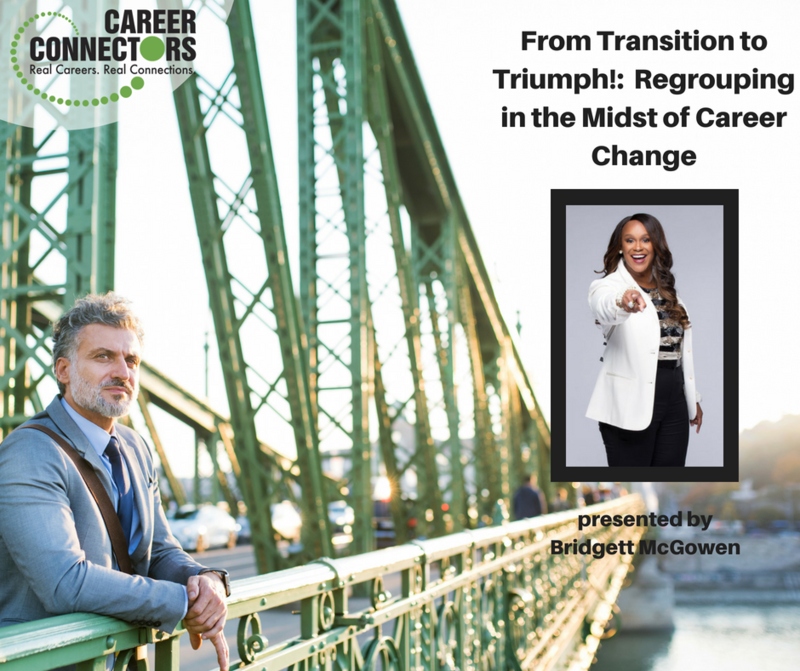 Our next event is Thursday, August 16 at Grand Canyon University when Bridgett McGowen-Hawkins will speak about “From Transition to Triumph: Mentally Regrouping in the Midst of Career Change.” Check the Career Connectors website for the topic and location of each week’s meeting and other resources for job seekers.